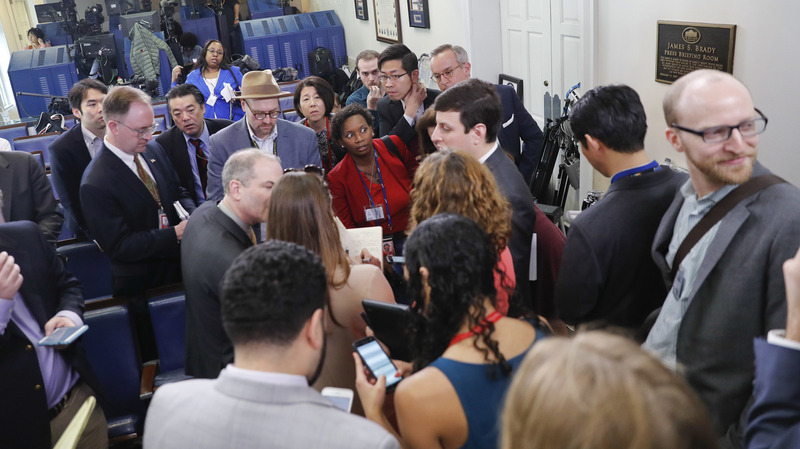 Spicer Bars CNN, New York Times, Others From White House Press Briefing The move blocked reporters from CNN, The New York Times and others from participating and was seen at least in part as retaliation for a Thursday CNN piece on White House-FBI communications. White House reporters line up Friday in Washington in hopes of attending a briefing in press secretary Sean Spicer's office. The off-camera briefing was limited mostly to pool reporters, broadcast networks and conservative-leaning outlets, with reporters for CNN, The New York Times, the Los Angeles Times and others denied entry. "These are moves that governments around the world make when they are less sophisticated and they want to block the press from doing its job, and it's sad to see that it's a tactic that the Trump White House is employing," CNN Worldwide President Jeff Zucker told NPR. "It has no impact on our commitment to reporting and the story. If anything it only further motivates us to make sure we ferret out all the facts." The latest chapter in the saga of the Trump White House's relations with the press kicked off Thursday night: CNN reported that senior White House officials intervened with the FBI to try to get the nation's top law enforcement officials to throw cold water on news reports about investigations of ties between the Trump campaign and the Russian government. The White House reacted furiously. On Friday morning at a convention of conservative activists, Trump once more attacked the media as phony and an enemy of the public. He drew a distinction between what he called "fake news" and the rest of the media, and particularly denounced reporters' reliance on anonymous sources. Early Friday afternoon, press secretary Sean Spicer held what's called a gaggle with reporters, during which he responded to questions on the record but without television cameras present. Journalists for CNN and other news outlets, including The New York Times, the Los Angeles Times, BuzzFeed, Politico and some others were kept out of Spicer's briefing in his office. Reporters for other major television networks, as well as those for a few conservative news organizations sympathetic to Trump, were ushered in. Designated pool reporters for the day, who share materials with their peers in print, radio and television, did attend. CBS Radio recorded and circulated audio with those news organizations that share pooling duties. Reporters from Time magazine and The Associated Press declined to participate in the briefing because their peers were turned away. Reporters noted several ironies. Even as Trump denounced the media for relying on anonymous sources in his address Friday morning, senior White House officials were trashing CNN's report but declining to do so by name. As several reporters noted, in an earlier life Trump used to call major newspapers using an assumed name to plant stories and offer comments as though he were someone else, acting as a publicity agent or spokesman for himself. Other media organizations, news executives and journalistic groups also publicly objected to being shut out. The New York Times' Dean Baquet said in a statement that it was unprecedented in the paper's history of covering administrations of both parties. "Free media access to a transparent government is obviously of crucial national interest," Baquet said. The White House Correspondents' Association and the National Press Club also weighed in. As captured in an audio recording of his exchange with reporters, Spicer said he decided whom to admit and added that he had decided to expand the group beyond a small cluster of pool reporters. He did little to allay concerns that CNN and others were targeted. "We're going to aggressively push back," Spicer said. "We're just not going to sit back and let false narratives, false stories and inaccurate facts get out there." Trump similarly rejected reports that had rocked his new administration. "I saw one story recently where they said, 'nine people have confirmed. ...' There are no nine people. I don't believe there was one or two people," Trump told attendees of the Conservative Political Action Conference. "And I said, 'Give me a break.' Because I know the people, I know who they talk to. There were no nine people." The Washington Post recently cited nine unnamed sources in reporting that then-national security adviser Michael Flynn spoke about sanctions against Russia with a top Russian diplomat before Trump's inauguration, despite Flynn's denials. Flynn resigned shortly after. "Everything we published regarding Gen. Flynn was true, as confirmed by subsequent events and on-the-record statements from administration officials themselves. The story led directly to the general's dismissal as national security adviser. Calling press reports fake doesn't make them so." Friday evening, CNN anchor Jake Tapper knocked the Trump administration for its aversion to accountability and "a lack of a basic understanding of how an adult White House functions." Tapper called its rejection of the press's role "un-American." Zucker said Friday's slight would not stop CNN from performing its role and called it another dangerous precedent showing hostility toward the press, citing Trump's verbal attacks and Spicer's repeated preference for calling on reporters from sympathetic news organizations. "It's silly on their part to retaliate like this," Zucker said. "I think it says more about them and the way they view the press, and the truth, than anything else. And that's unfortunate."